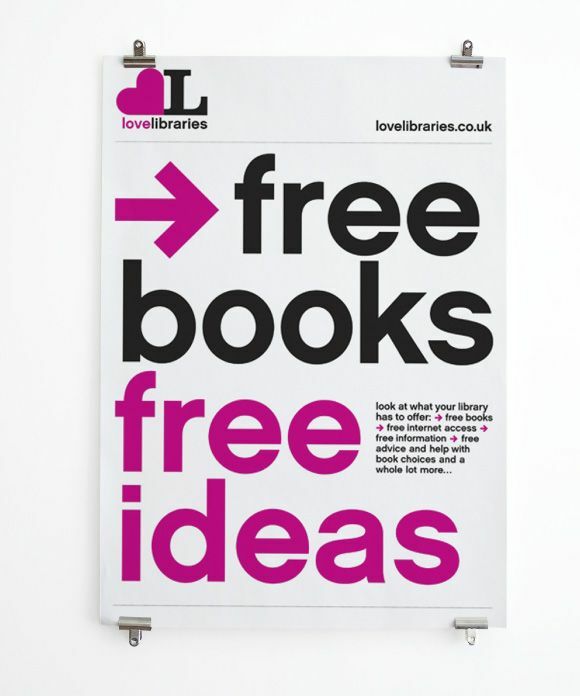 The Love Libraries campaign, which launched in the UK in March 22, 2006 and ran over the next few years, is one that Ad/Lib is pulling out of the dustbin of internet history. The web, as it does over time, washes away the traces of dead marketing campaigns after they finish: the website, lovelibraries.co.uk, is gone after taken over by spammers, and the design company, Red Stone, has left the project off their webpage. Thanks to image collection websites like Pinterest, and the Wayback Machine, we can still salvage pieces of this now-defunct marketing campaign. 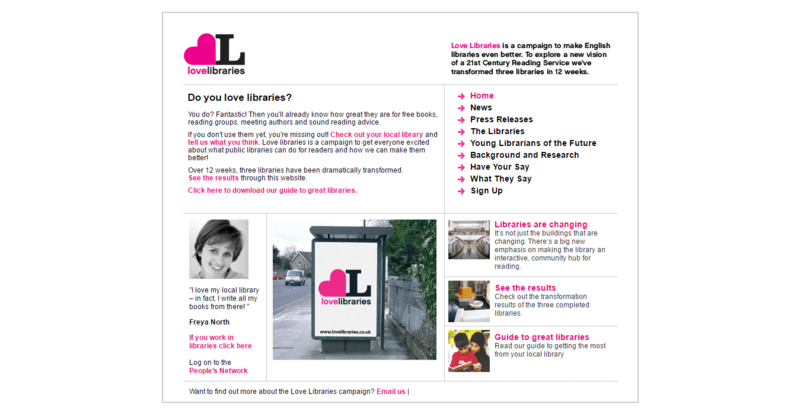 “The Love Libraries campaign was launched in March 2006, and kick started by Reading Partners; a consortium of The Reading Agency and nine British Publishers; who joined up with the Museums, Libraries and Archives Council, the Department for Culture, Media and Sport and the Society of Chief Librarians to form the Future Libraries Partnership. Beyond the renovations that launched the campaign, marketing efforts focused on telling the public that libraries were changing for the better. For example, one component of the campaign involved acknowledging and awarding upcoming and new librarians, with a “Top Ten Young Librarians of the Future” award handed out in 2006 to up-and-coming 20-something librarians (Newbutt and Sen, 2009). The campaign also solicited comments from a variety of writers and creatives from the UK, including people like documentarian Louis Theroux and authors Irvine Welsh and J.K. Rowling. Marketing materials included a variety of promotional items (posters, mugs, bags, shirts) as well as advertising for transit (see below). British libraries at the time were under threat of financial cutbacks and closures – the Love Libraries campaign sought to demonstrate to the public that libraries were in fact having a resurgence of use, and that they can expect a modern service. The two documents below exemplify this approach. Unfortunately, ten years on, British Libraries are still facing difficult times (BBC, 2016). BBC, 2016. Libraries lose a quarter of staff as hundreds close. BBC News. [online] 29 Mar. Available at: <http://www.bbc.com/news/uk-england-35707956> [Accessed 13 Nov. 2016]. Newbutt, S. and Sen, B.A., 2009. What impressions do young peope have of librarianship as a career? In: Strategies for regenerating the library and information profession. [online] 8th World Conference on Continuing Professional Development and Workplace Learning for the Library and Information Professions. Bologna, Italy, pp.46–60. Available at: <http://dx.doi.org/10.1515/9783598441776.1.46> [Accessed 13 Nov. 2016].